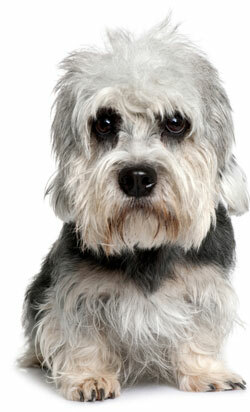 The Dandie Dinmont Terrier is an affectionate, loyal, determined, spunky and fun-loving companion. He can be quite bold and persistent, but can also be calm and focused. He has a surprisingly loud and deep bark, and makes a very good watchdog. He's quite protective of his family, and sometimes needs to be told that one bark is enough! He makes friends quickly however and is a very sociable and polite dog. He is fond of children, though better with older children. He can live with younger children if they are respectful toward him. He may snap or bite of he is treated roughly or pushed too far. He is not easy to train, being very independent-minded and somewhat stubborn. You will need to be patience to teach him. He is reserved around others dogs, especially male Dandies. He is not good with small or non-dog pets, although he can get used to cats if he's raised with them while still a puppy. He is an active, lively dog indoors who has lots of playful energy and needs a moderate amount of exercise, including some regular walks and romps out in the yard or at the park. He must be kept on a leash while walking because he will chase small animals. He loves to dig, and shouldn't be left alone in a yard. He virtually doesn't shed, and would be a good pet if you don't like dog hair in the house. The Dandie Dinmont Terrier is 8 to 11 inches tall (to shoulders) and weighs 18 to 24 pounds. He has a medium-length, wiry coat consisting of a short, soft undercoat with wiry hairs on top. His coat color can be bluish black to silvery gray, or reddish to pale tan. His coat basically maintains itself and only needs an occasional brushing. Pet coat: Clipped short every few months. Show coat: Stripped (dead hairs plucked out) every few months. The Dandie Dinmont Terrier is descended from tough terrier breeds from the English and Scottish border region, and was named after a character in a Sir Walter Scott novel. Beginning in the early 18th century he was bred to hunt otter and badger, and was also used by farmers to catch mice. The first Dandie Dinmont Terrier Club was formed in England in 1875, and the breed was admitted to the AKC in 1888. Today the "Dandie" is one of the rarest and most endangered of all purebred dog breeds. His AKC popularity was 148th out of 157 breeds in 2007.